Getting married during the winter can be incredibly romantic, and if it snows, you can take some breathtaking wedding photos! However, there is one major issue here. It’s cold out, very cold! Your wedding photos will not come out well or natural looking if everyone in your wedding party is shivering and turning blue. However, there are ways to take advantage of the magic that the winter session offers without the cold fingers and toes. Are you looking for ways to stay warm at a winter wedding? Check out some of the ways to keep warm, without sacrificing style during your big day. If you want to be comfortable indoors and outdoors, it is crucial that you dress in layers. It doesn’t matter if you are wearing a dress, trousers, or a suit. You can wear leggings, thermals, or tights under your clothes for an extra layer of warmth. Corsets are also another great way to add an additional layer of warmth. Covering up with a cardigan, a knitted sweater, or a wrap is a great way to stay warm while staying fashionable. Another bonus? Wraps are easy to take on and off! If you want to keep warm and look good at the same time, try wrapping yourself up in faux fur, a capelet, shawl, or a wool scarf. Look for an outfit that features a heavy material, long sleeves, a long dress, and has a high neckline. Since it’s not summer you do not want something light and airy, you will need quite the opposite. Also, look for clothing that features velvet, which is elegant and warm! If the warmest dress you can find is pretty plain, dress it up! There are plenty of ways to upgrade your accessories to add some instant glamour and color to your outfit. Add a pair of leather gloves, wear a fashionable hat, and rock shoes that have some style to them. Discover our top tips for finding your perfect wedding dress. To help your guests stay warm, give out blankets, scarfs, mittens, and/or matching shawls. If your budget does not allow for this, make sure you have these items available for your bridal party. This thoughtful gift of warmth will be appreciated by all when it comes time to take photographs outdoors. If you and your guests will be doing any kind of walking outdoors from one location to another, provide a form of transportation that has heat. It doesn’t have to be anything fancy if your budget doesn’t allow for it. Even a warm and cozy minibus will be appreciated by all. Say your vows in the perfect winter wedding venue in New York City – the Aqua Azul. Discover a private, luxury wedding yacht with top-notch sophistication, impeccable service, and breathtaking backdrops. 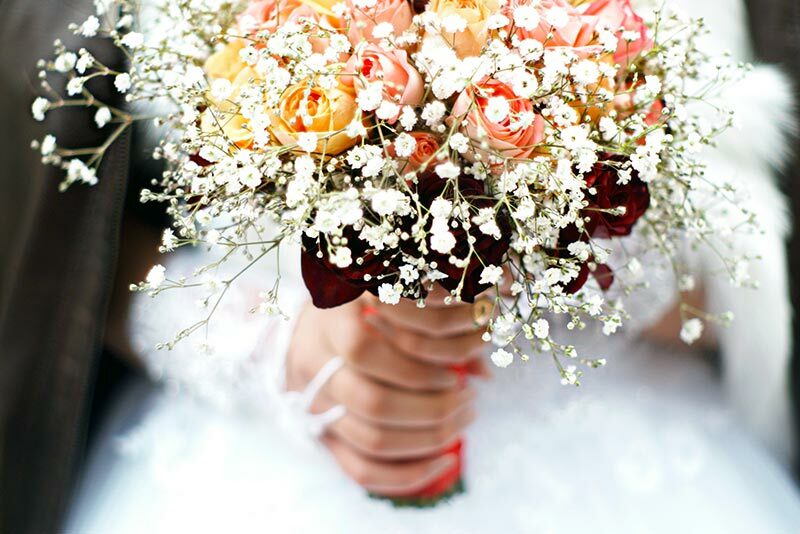 Schedule a free wedding estimate or a call with one of our NYC wedding planners.